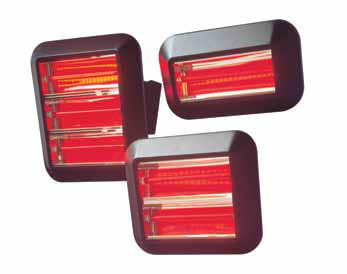 Ruby sleeved halogen lamp for warm red glow. Compact dimensions with universal mounting bracket. Energy efficient – only heats the area that needs heating, not the whole building. Powder-coated steel case finished in high temperature matt black. Specular quality electrochemically brightened aluminium. Halogen lamp incorporating Tungsten element.